Work, play, and everything in between is simply done better in the new 2016 Ford F-150 Limited. As the highest trim level of the F-150, it is blessed with all of the premium offerings and technology, in addition to its performance which not only packs a punch but is also very efficient for the light duty truck category. The 2016 Ford F-150 Limited out-matches its competition in the luxury truck category starting from the outside in with its unmistakable style and aggressive essence. Standard wheels are 22” polished aluminium for and striking appearance. A chrome front bumper and body-coloured rear bumper make for a bold and cohesive look that will turn heads wherever you drive. Ultra-premium features such as power-deployable running boards and dual glass power-adjustable side mirrors with integrated LED approach lamps and LED spotlights make the new F-150 a class-leader. LED box lighting is a standard feature while a spray-in bedliner is an available option. Distinct quad-beam LED headlamps and LED taillamps are bold and functional in an array of conditions. The tailgate step with tailgate lift assist makes accessing the back of our truck bed easy and convenient. Enjoy a spectacular view and let the fresh breeze in with the standard twin panel power moonroof on the 2016 Ford F-150 Limited! Spacious and supremely luxurious, the 2016 Ford F-150 Limited boasts a SuperCrew cab with seating for up to five passengers. Dual-zone electronic climate control offers easy and convenient operation of custom temperature settings for each side of the cabin. Unique multi-contoured leather seating is luxurious and comfortable to take the sophistication of the the F-150 Limited cabin to new heights. Heated and cooled front seats and heated rear seats combat extreme temperatures for year-round comfort in the in F-150 Limited. The 360 Camera offers an unparalleled look of is directly around your vehicle, ideal for nimble navigation of busy work sites and tight spaces. The Pro Trailer Backup Assist makes getting hooked up and on your way a breeze. 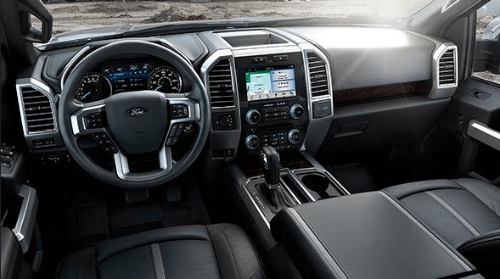 Take advantage of the industry-leading SYNC 3 infotainment system which is standard on the 2016 Ford F-150 Limited. Performance capability is met by the 3.5L EcoBoost V6 engine in the ﻿﻿﻿2016 Ford F-150 Limited﻿﻿﻿. The electronic 6-speed automatic transmission with Tow/Haul and Sport modes for enhanced capabilities. Standard features such as trailer brake control and trailer sway control make the F-150 Limited the premier choice for towing. The ﻿﻿﻿2016 Ford F-150 Limited﻿﻿﻿ leads the way in the truck category year after year. Safety is paramount in the design of the ﻿﻿﻿2016 Ford F-150 Limited﻿﻿﻿ with its abundance of advanced safety technology and features. See for yourself why F-Series are Canada’s most popular trucks when you test drive the﻿﻿﻿ 2016 Ford F-150 Limited﻿﻿﻿. 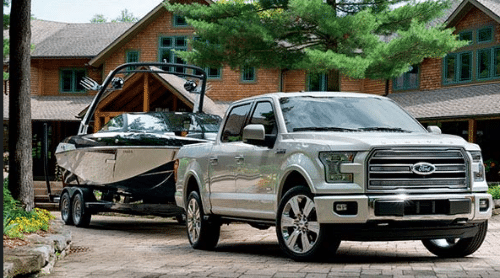 As the F-150’s most esteemed trim level, the Limited goes above and beyond when it comes to luxury, technology, and the reliable performance capability that Ford is renowned for! Visit your local Okanagan Ford dealer - Watkin Motors Ford to check out our large inventory of new F-Series truck models. ﻿﻿Watkin Motors Ford﻿﻿ has a wide-ranging inventory of new Ford truck, SUV, sedan, and hatchback models!